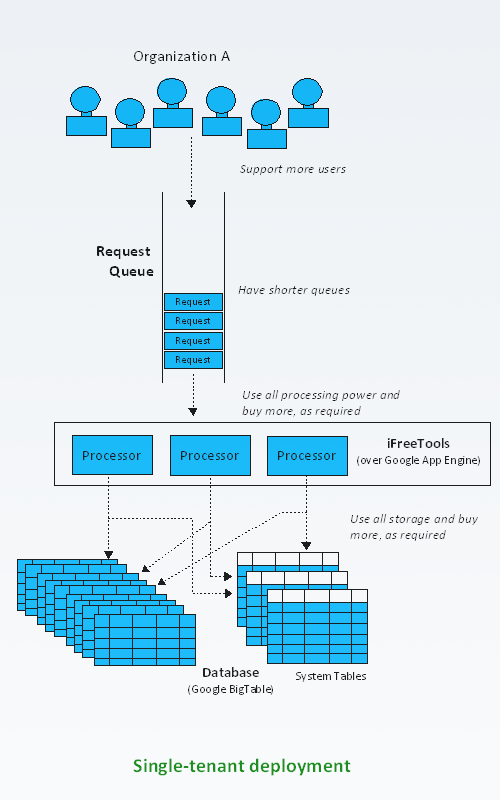 iFreeTools Creator as available at http://creator.ifreetools.com is a multi-tenant deployment over Google App Engine. Multi-tenant systems use shared resources to accommodate multiple organizations within the same deployment. Note : Almost all SaaS(Software-as-a-Service)-based hosted apps -- where one can just sign-up and start using the application online -- use multi-tenant deployment option to offer better value for money. 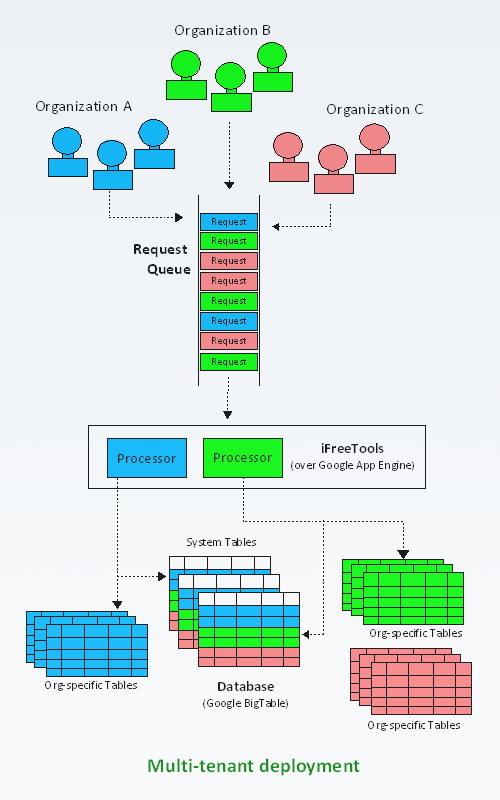 Requests made by the users of multiple organizations are queued up and processed by iFreeTools within Google App Engine. When serving to a specific organizations web-request, the data corresponding to that organization is queried from the shared system tables and from the organization-specific tables to send out the requested web-page. iFreeTools is also available in Single-tenant deployment option, where-in iFreeTools will be deployed into your own Google App Engine account. In this mode the resources for that deployment are for dedicated-use by your organization alone. With single-deployment, the web-requests will *not* be delayed due to other organizations accessing the same deployment. Single-deployment also enables you to use the free quota made available for all Google App Engine accounts and to further purchase additional resources at affordable pricing directly from Google. For details on the available subscription plans for single-tenant deployment, kindly refer to http://creator.ifreetools.com/pricing.